One of my favorite TV critics, Aaron Barnhart of the Kansas City Star, was vacationing in Canada during the Canadian debates. He talks about our media situation and our debates in a short podcast that you can find on his website. Canadians often compare their politics with those in the United States, especially when we're both in the midst of elections. It's unusual and refreshing to hear an American perspective on the same comparison. He notes the Canadian complaints that our debate was all about style and not about substance. His conclusion? "Man, these people have no idea." His host concludes, "They would probably run screaming from the room if they were watching ours...."
Interesting article, but you just have to love the female interviewers reactions to Aaron's description of the debate. response to 5 major parties in debate - "ughhh"
Aaron does seem to like the CBC even though it's "state run tv". 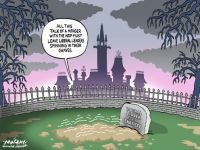 Will the NDP wake up and respond to the threat the Greens pose? Plagarism is Always Wrong, Mr. Harper. The Greens shouldn't have been in the debate anyway.